Tablet in a Minute: 10.1" ViewSonic gTablet for $269! If you are really wanting a tablet but you are not ready to dish out the $499 for a brand new tablet here is your chance. The ViewSonic gTablet looks to be the undertaker in the tablet market. With a 10.1" screen, running Android 2.2, a 1.3mp front facing camera, 1GHz dual core processor, a 8-10 hour battery, Wi-Fi, 16GB internal storage, and a microSD card slot. I can see this being a great tablet for around the house computing or for watching your media and using apps on the go. Woot.com has a great deal today on the ViewSonic gTablet for only $269. This is a brand new tablet and not refurbished like many of the electronics you may see on Woot. If you have not heard of Woot is a website that gives 1 deal a day. This is the deal for today, June 6, 2011, come tomorrow and the deal will be gone! 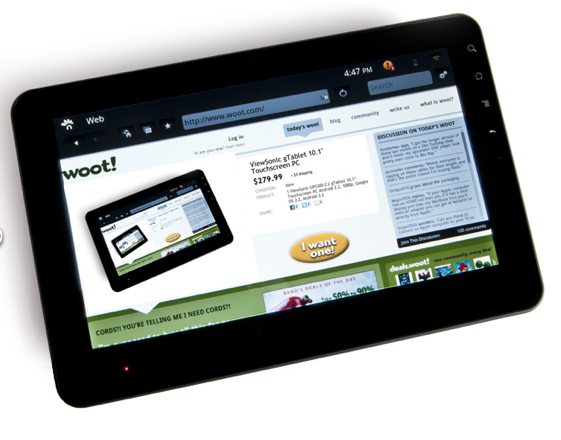 With Father's Day just around the corner this would be the tablet sure to please dad, or grandpa. If you want to compare this to other tablets on the market make sure you visit my Ultimate Tablet Spec Guide to make sure you are getting the best tablet for your money. Be sure to buy quickly or it will be the missed opportunity for the perfect present.